Experience Christmas in July with this festive, low-growing perennial. The delicate, 1-1½" white flowers, tinged with red, look like candy canes as they sway above the cloverlike mound of leaves. These charming plants bloom from July through fall. When planted in areas without severe frost, they come back year after year, and are the perfect choice as a ground cover or in rock or alpine gardens. They can also be grown indoors. 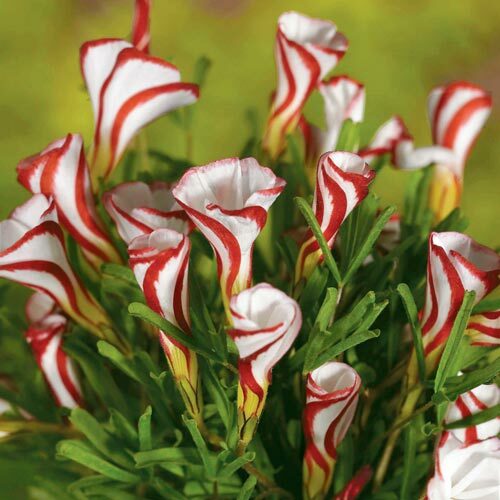 Growing 6" tall with a 2-3" spread, Oxalis versicolor (Candy Cane Sorrel) performs best when planted in well-drained soil where they receive full sun to partial shade. Start helican shaped to open fully with five petals. 1 - 2" deep and 2 - 3" apart. Lift in winter, otherwise provide layer of mulch for winter.